The caterpillar roll, which is often referred to as a dragon roll, is an enticing popular sushi roll. It is characterized by intricate layers of thinly sliced avocado pieces placed on top of the roll, making it resemble the back of a caterpillar. Many people like the caterpillar roll for its artistic look which is almost too pretty to eat! Known for its unique insect like appearance, the common caterpillar roll contains rice, nori sheets (nori = seaweed), cucumber, eel (Unagi), and avocado. 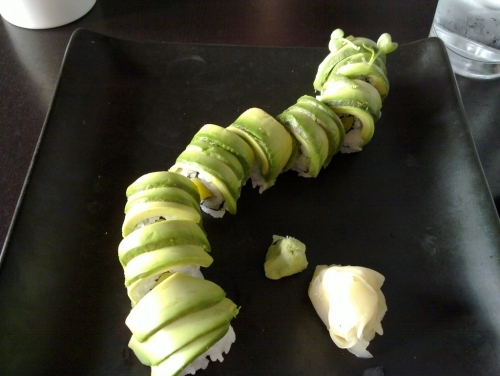 The interior of the roll includes eel and cucumber and the exterior is rice with the layers of avocado. Some sushi restaurants also include watercress or another type of green matter as the “antennas” to add to the bug like appearance. The taste of the caterpillar roll is somewhat mild compared to many of the spicier rolls. The blend of avocado, cucumber, and eel is pleasing to the palate and is complemented nicely with soy sauce or pickled ginger slices. Add wasabi (Japanese horseradish) if you’re looking for a kick. 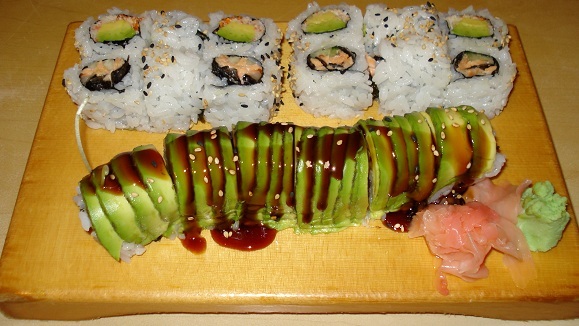 Like many of the sushi rolls consumed in North America, the caterpillar roll has its roots in the west. Many sushi chefs like to add their own unique spins to the original roll that make a playful difference to the typical caterpillar roll. It's one of those sushi rolls that can be tweaked and still come out wonderful! The average caterpillar roll is in the mid price range for "specialty" sushi rolls, ranging from $10-$15 depending on which part of the country you live in - the coastal regions tend to be pricier as opposed to the more inland areas. 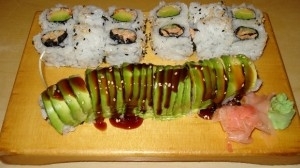 The caterpillar roll is definitely a roll that should be on every sushi connoisseur’s and amateur’s sushi bucket list. Not only is it a delicious treat, but very pleasing to the eyes as well! Click here for an extensive list of Sushi from around the World. Many people are not clear about the difference between sushi and sashimi. 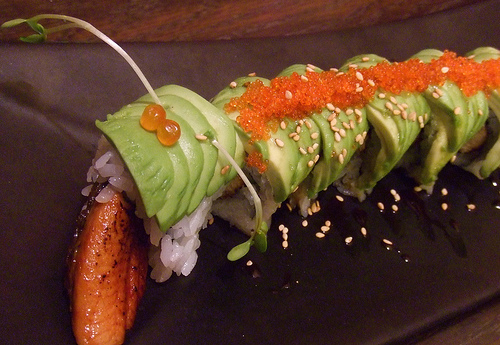 If you've ever ordered a plate of sushi, then chances are you have encountered Wasabi Paste. Sashimi is a Japanese delicacy of mainly thin sliced raw fish (or meat). The Iron Chef TV show has entertained the Japanese audience for well over a decade with its first episode premiering on the 10th of October in 1993.